In the February issue of Martha Stewart Living there is a wonderful tutorial on making three-dimensional Valentine's Day cards for your sweetie. The materials and instructions are simple and the finished products are beautiful, handmade keepsakes to treasure. The best part about the projects is that they are artfully assisted by the use of free, downloadable templates and drawings designed by the Martha Stewart team. I love the free clip-art that the magazine provides in each issue and my PDF folder is almost bursting with saved templates from previous issues, from previous years. These ones below will also be added. Click Here to download all of the templates needed for these projects and see below for a brief synopsis of the projects. I'm sure you'll be as inspired as I was! Can you guess what my favourite card is? What's yours? There is a wide array of 3-D cards to try. Just choose your favourite, select your papers and download the templates before you begin. 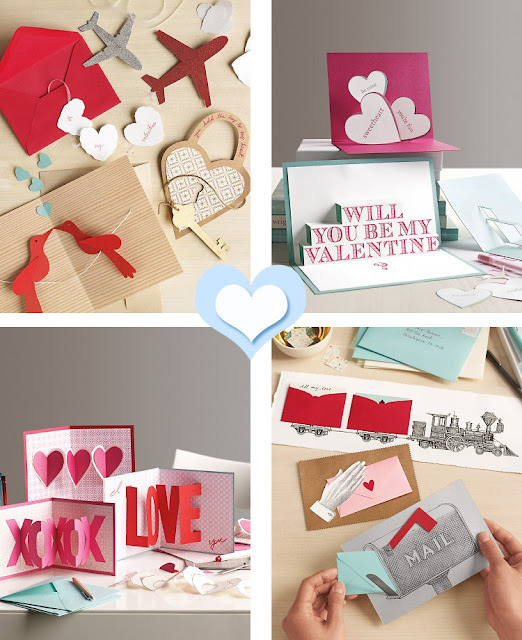 What better way to communicate your love to your main squeeze than with an accordion-fold card? A quick print, cut, and crease is all it takes to make a card with a trio of hearts, a big LOVE, or sweet old XOXOs. 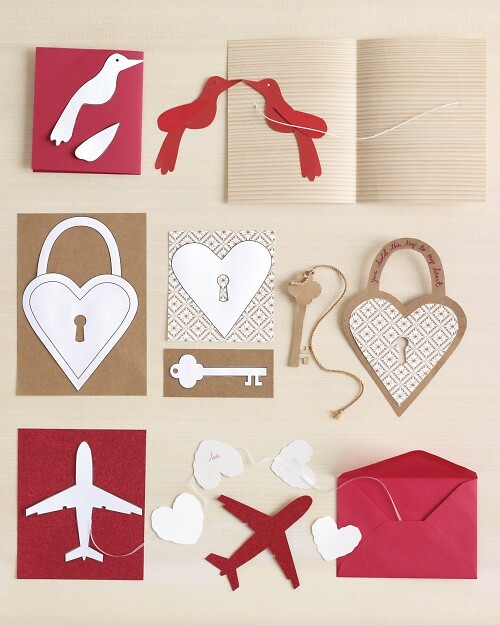 An airplane chased by a lovey-dovey contrail, a heart-shaped lock with skeleton key, two little lovebirds sitting on a wire -- these garland-style cards simply require ribbon, cord, or twine. Mixing patterned and solid-color papers helps create contrast and adds visual interest. A crush can be more powerful than a locomotive. It can also be as sweet as a hand-delivered note, or as cheerily optimistic as an upturned mailbox flag. 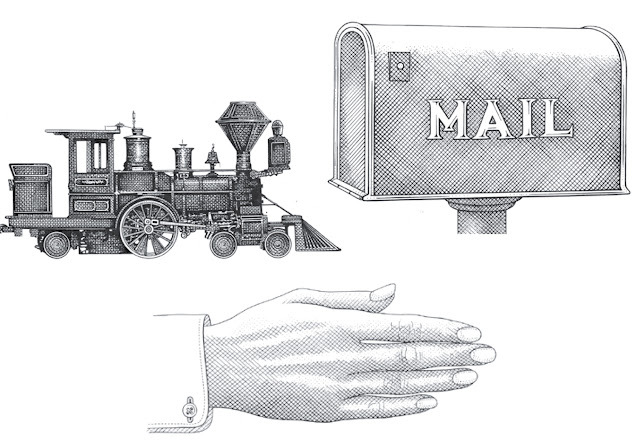 These clip art illustrations require a few simple cuts and a couple of pieces of tape. 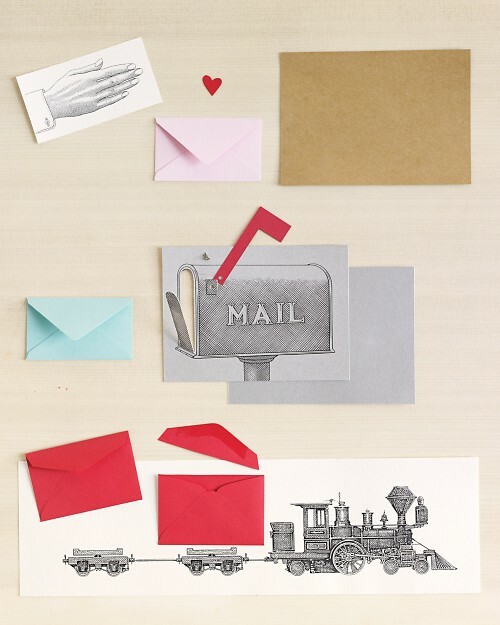 The little envelope acts as a card within a card, containing a secret love note or special gift card. These are the illustrations that you can download at MarthaStewart.com to print at home for use in these projects. 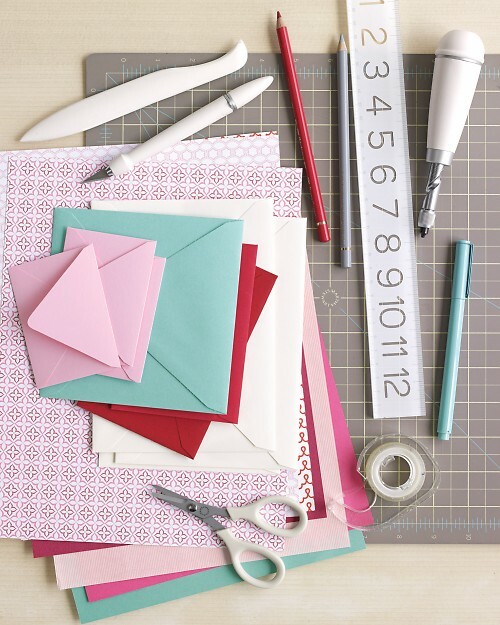 The Materials: Card stock, scrapbook paper, and envelopes; Pens and pencils; Scissors; Ruler; Craft knife; Self-healing cutting mat; Double-sided tape; Hole punch; Bone folder. I downloaded today my February digital issue of Martha Living, beautiful issue and love the craft tutorial section. I am pinning your inspiring posts Andrew, have a wonderful weekend.